U.S. Department of Agriculture (USDA) scientists are taking their studies to the field to gauge the survival rate of a new line of rainbow trout that is resistant to bacterial cold-water disease. 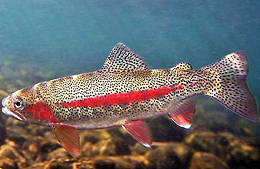 ARS scientists are field testing a new disease-resistant rainbow trout. Photo courtesy of U.S. Geological Survey, Bugwood.org. The disease often kills young, smaller cold-water fish species and impairs growth and yield in larger, older fish. In addition to developing a disease-resistant trout line, researchers at the Agricultural Research Service's (ARS) National Center for Cool and Cold Water Aquaculture (NCCCWA) in Leetown, West Virginia, created a susceptible line and a control line to use in studies. Molecular biologist Greg Wiens and geneticist Timothy Leeds at NCCCWA recently evaluated the three trout lines in field trials. Partnering with the aquaculture industry and government stakeholders, they measured performance of trout under farm conditions before and after natural exposure to the pathogen Flavobacterium psychrophilum, which causes bacterial cold-water disease. The rate of survival for the disease-resistant line was higher, and fewer disease-resistant fish harbored the pathogen in their internal tissues compared with the control and susceptible fish. A highly sensitive real-time polymerase chain (PCR) reaction test, developed by Wiens and postdoctoral fellow David Marancik, was used to confirm that the resistant trout line did not harbor any detectable pathogen. The PCR recognizes a unique gene sequence found only in pathogen and accurately measures small amounts of it in fish tissue. In other studies, scientists identified a genetic link between a physical trait—spleen size—and specific disease resistance in fish. Wiens and research geneticist Yniv Palti found common genetic regions in trout that influence both spleen size and disease resistance, and they are conducting further research to identify the genes that are responsible. Read more about this research in the October issue of Agricultural Research magazine. ARS is USDA's chief intramural scientific research agency, and this research supports the USDA priority of promoting international food security.